Climate change could reduce the amount of wind available for power production in both the UK and the US, new research suggests. The arrival of weaker winds in the northern hemisphere as a result of global warming could cause average windfarm output to fall by around 10% in the UK and 14% in the US by 2100, the lead author tells Carbon Brief. Meanwhile, climate change could strengthen winds in parts of the southern hemisphere by the end of the century, the research finds, including in Australia, Brazil and South Africa. However, the study’s conclusions rely on models that have relatively low spatial resolution, other scientists tell Carbon Brief, which could affect the accuracy of the results. 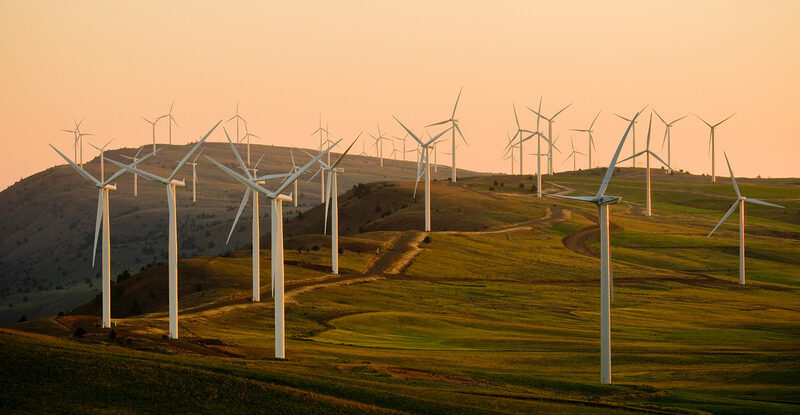 Investment in wind power is part of many countries’ strategies for meeting the goals of the Paris Agreement, which strives to limit warming to well below 2C. But some parts of the world have more favourable conditions for wind power production than others. This is due in part to prevailing weather patterns, such as the jet stream, as well as recurring atmospheric processes, including El Niño and La Niña. The map below shows the average total wind resource in different parts of the world between 1980 and 2005, with high wind power potential shown in yellow and low potential shown in blue. Boxes highlight areas that were chosen for analysis in the new study. The map indicates that many parts of the northern hemisphere, including the UK and Ireland, central US and parts of Scandinavia, currently have high wind power potential, while parts of the southern hemisphere, including Brazil, have lower potential. “Global climate models do not calculate wind power, per se, like they do for other general variables like temperature, humidity and simply wind itself. Wind power is not quite the same as just wind speed, so we took the variables that are calculated directly by the global climate models and used an industry wind turbine power curve as something of a translation device. But in the southern hemisphere, many regions could be hit by more wind as the climate warms. In Brazil, wind power potential could increase by 42% by 2100 and in Australia, potential could rise by 41%. 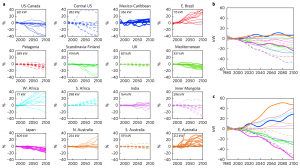 However, this rise in wind potential is only projected for a high emissions scenario (RCP8.5). 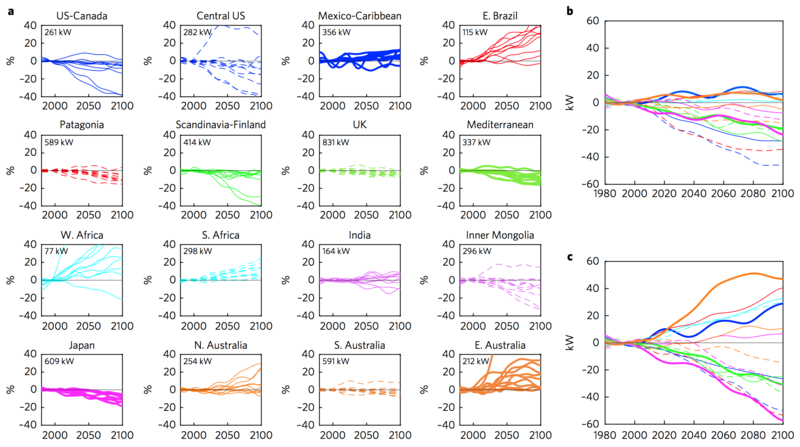 The results are shown in the charts below, where the simulated change in wind power potential from present day until the end of century under RCP8.5 is broken down by region. On each graph, one line represents the result of one climate model and the number in the top left shows the current wind power potential. Lines reaching below zero show an overall decrease in potential, while lines above indicate an increase. “Wind usually derives its energy from instability in the atmosphere, and a major source of that instability in the northern hemisphere is the equator-to-pole temperature difference. We all know the tropics are warmer than the Arctic. “The resolution of the models is only around 100-200km – this is not very accurate. Also they use monthly average data from the models, which ignores day-to-day variations.